Airport transfers to Flumet, Espace Diamant - a great place for all types of mountain adventures! Located in the Savoie Alps, Flumet is part of the Espace Diamant ski area. Universal ski pass will allow you to ski in other resorts in Espace Diamant ski area: Crest Voland Cohennoz, Les Saisies, Notre Dame de Bellecombe and Praz Sur Arly. Flumet is an ideal place for intermediate skiers and snowboarders. It is a true village-resort with long and rich history. First buildings appeared here between 12th and 13th centuries. Flumet is surrounded by forests, rivers, alpine pastures and rocks. There are beautiful views over to Mont Blanc. Flumet is a great place for family holidays! The small town of Flumet is located in the department of Savoie of the french region Rhone-Alpes. This traditional village at the heart of the Alps has about 827 residents. Situated in the heart of the Espace Diamant ski area, the resort of Flumet boasts a scattering of chalets between 800 and 2500 metres altitude. At 1000 metres above sea level and at the foot of the Mont Blanc, the Flumet ski area with its 185 kilometres of ski slopes is accessible to skiers of all levels. The pistes are large and easily accessible. In this genuine rural ski resort, which merges Flumet and St Nicolas la Chapelle districts, traditions, snow-covered landscapes, beautiful panoramic views, a variety of charming villages and quality sports facilities come together in complete harmony. Flumet’s historical village with wooden chalets scattered around the St Nicolas church tower and downhill skiing opportunities is a wonderful chance to combine historical sightseeing and skiing or snowboarding pleasures. Especially good for families. This resort is less than a 2-hour driving distance from four large airports. Chambery Airport and Geneva Airport are just one hour’s drive away. While train services to Flumet, Espace Diamant are available, you may find it easier to book an airport transfer from the airport where you land. Airport transfer is the most cost-effective and time-saving way of getting to the ski resort. The closest trains stations to Flumet is Gare des Sallanches and Albertville. From Geneva Airport - take a bus to Flumet via Annecy and Ugine - Les Fontaines. Duration of the trip: up to four hours. From Chambery City centre take a train to Albertville, then change the bus to Flumet. Duration of the trip: about four hours. From Grenoble City centre take a train to Albertville via Montmelian, then change the bus to Flumet. Duration of the trip: five hours. From Lyon Airport take a train to Albertville via Chambery, then change the bus to Flumet. Duration of the trip: four and a half hours. We carefully calculate all resort transfer services individually, to ensure that our customers never overpay. Whenever you choose to travel and whatever your final destination, Alps 2 Alps will get you there for the lowest possible price. However, we advise booking early to access the best possible deal. In addition, keep up to date with Alps 2 Alps for the latest offers, deals and discounts on Flumet, Espace Diamant ski resort transfer services. All of the above will only ever result in our base-rate for ski transfers going down – we never over-inflate our prices at any time or for any reason. We also offer substantial discounts for off-peak, off-season and midweek transfers to Flumet, Espace Diamant. If looking for the best possible deals, travelling outside peak season or midweek typically results in the biggest savings. We offer midweek (Monday to Friday) prices with up to 60% discount than weekend prices. Your transfer quote will also depend on vehicle availability, transfer schedule, vehicle utilisation and other costs like road tolls and airport parking charges. In all instances, we work hard to keep our prices low and are relentlessly committed to total value for money. Which is why we guarantee you won’t find a better deal on your Flumet, Espace Diamant resort transfers, whatever your needs. The resort of Flumet, Espace Diamant lies at an elevation of 894 metres, with a max vertical of 1,070m and its highest lift going as far as 2,070m. There are a total of 50 pistes in Flumet Ski Area, served by 42 ski lifts. 32 green, 58 blue, 47 red and 9 black pistes offer you fantastic skiing abilities for all levels -from Beginner to Expert. There are 25km of cross-country pistes for those who prefer to catch a breath from downhill adventures. 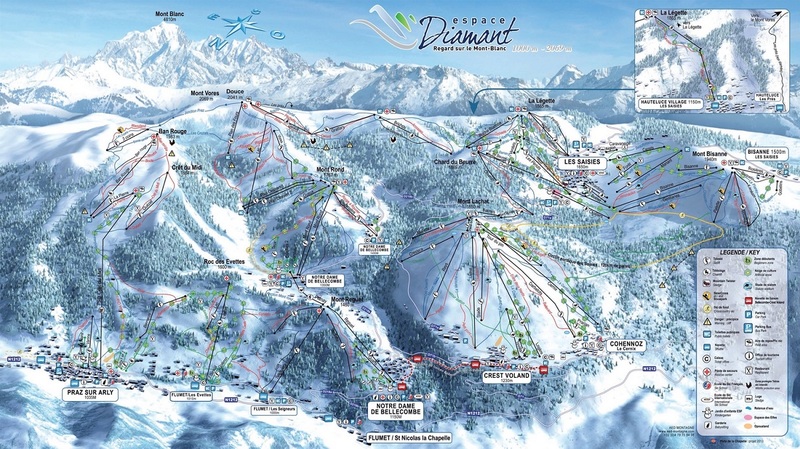 And it's important to remember that Flumet, Espace Diamant is part of the Espace Diamant ski area with access to 185km of downhill skiing, with 226 individual pistes, served by 136 ski lifts. In addition to the skiing in Flumet itself, your ski lift pass will allow you to ski or snowboard in the other Espace Diamant ski resorts. Flumet Ski Resort is a perfect place for family holidays: there is the ski school for children from 3 years old. Flumet can make your vacation unforgettable: there is a wide range of activities for kids throughout the season such as clown and puppet shows, drawing and photo competitions and lantern parades. Flumet also offers alternative snow activities such as ski touring, snowshoeing, cross-country skiing, sledging, dog sleighing, and many more. Flumet, Espace Diamant invites you to experience an unforgettable family holiday! Flumet, located a few kilometres from Megève, attract many visitors with its winter activities such as visiting Grand-Bornand Ski Lift, Petit Rochebrune Gondola and Chamois Gondola. Top attractions in the area include Mont Blanc and Bellevue Cable Car. There are some beautiful places in Flumet that are definitely worth seeing! While many people do use the public transport to get to the ski resort, this may take up a long time to reach the destination. By booking an airport transfer you will get the added bonus of travelling in comfort. Not all resort transfer services can promise this – Alps2Alps guarantees a higher-level service for every passenger.